Let’s say that an institutional forex trader wants to buy GBP/JPY but can’t because there isn’t enough liquidity. 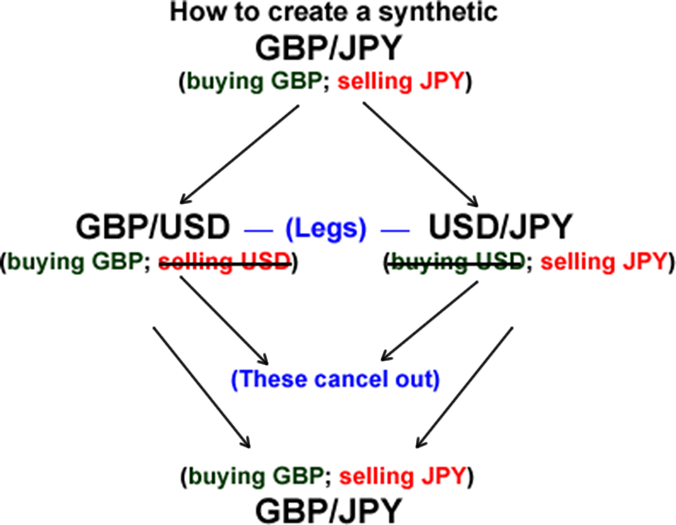 To execute this trade, they would have to buy both GBP/USD and USD/JPY (earlier in this lesson, we learned that these pairs are called its legs). But it wouldn’t be too smart. Ever since the great Al Gore “invented the internet,” technology has improved to the point now that even weird currency crosses like GBP/NZD or CHF/JPY can now be traded on your forex broker’s platform. And let’s not forgot about margin use! Creating a synthetic currency pair requires you to open two separate positions and each position requires its own margin.